Thomas Newcomen was a lifelong and ardent Baptist. He came from a family in which religious observance was an important part of daily life — his great grandfather was a clergyman. However, it was his grandfather, also named Thomas, who had turned to the Baptist faith in later life, and his descendants followed his example. It is widely accepted that the Baptist movement originated in the first decade of 17th century, in Amsterdam and in England, as a reaction against certain doctrines of the Church of England. One tenet of the faith is that only professing believers should be baptised, not infants. Elders and deacons lead Baptist congregations, and the latter can be men or women. Newcomen met his wife Hannah Waymouth through the Dartmouth Baptists, who no doubt retained connections with the Kingsbridge Baptists near Hannah's birthplace at Malborough. Despite his ardent beliefs, Thomas and Hannah had their children baptised by the Church of England soon after each was born — infant mortality was then an ever-present danger. When Newcomen's father (Elias) was a youth, Kingsbridge was the location of the nearest Baptist meeting house to the family home in Dartmouth. Elias was part of a group that persuaded scholar John Flavell (c.1630-91) from Bromsgrove in the West Midlands to move south in 1656. Flavell led the congregation at St Clement's in Townstal, and preached on alternate Wednesdays at St Saviour’s in Dartmouth — where Newcomen was baptised in 1663/4. The parliamentary Act of Uniformity of 19th May 1662 stipulated the form that Anglican worship should take, and adherence to its tenets was mandatory for all ministers. Flavell was among many who refused and were excluded from the Church of England in what was called the Great Ejection. They became known as 'non-conformists' and included members of various Protestant groups as well as Baptists. Flavell continued his Baptist ministry in and around Dartmouth, despite prejudice against non-conformists before the Declaration of Indulgence of 15th March 1672. Non-Anglican worship was made legal by the Toleration Act of 24th May 1689. As mentioned earlier, it is thought very likely that Newcomen and his elder brother John were educated by Flavell in the 1660s and 1670s. It seems that Newcomen’s non-conformist views must have been awkward politically, for he wasn't made a freeman of Dartmouth as would have been usual for a tradesman. His business partner, plumber and glazier John Calley was also a Baptist, though did enjoy the status of freeman. However, the Baptist network may have helped Newcomen in other ways. 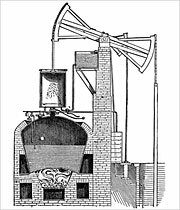 The Coneygree colliery steam engine of 1712 is a few kilometers from the Baptist church at Netherton, which had strong ties to the church in Bromsgrove — Flavell's birthplace. In 1719, Humphrey Potter (1655-1721) willed the Baptist meeting house in Bromsgrove to its trustees, one of whom was Newcomen. Moreover, prominent members of the Joint Stock Company of the Proprietors of the Invention for Raising Water by Fire (see Engines eveywhere) — Wallin, Trengove, Elliott and Robinson — were all Baptists. After the death of Philip Carey, pastor of Dartmouth's Baptist church 1685-1710, Newcomen seems to have taken over pastoral duties to some extent, including doing some preaching. 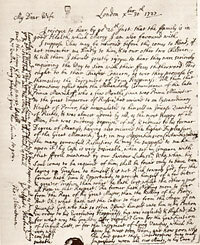 This was evidently something he regarded as important for in a letter to Hannah dated 30th December 1727 he urges her to tell their three children that he "should greatly rejoice to hear they were seriously enquiring the way to Sion with their faces thitherward: This ought to be their Chiefest Concern". Joseph Hornblower (1696-1762), who worked on a Newcomen engine at Wheal Rose mine in Cornwall in 1725 was another Baptist, and married his first wife in Netherton church. One might say that the Baptists were linked to the early years of steam power. Perhaps their non-conformist views enabled them to think about engineering matters in a different way, and so promote the development of the atmospheric engine. In the Dartmouth Museum archive is a letter in Thomas Newcomen's hand. It's addressed to his wife Hannah, and dated December 30th 1727 and written from London. Newcomen urges her to tell their three children that he "should greatly rejoice to hear they were seriously enquiring the way to Sion with their faces thitherward: This ought to be their Chiefest Concern".